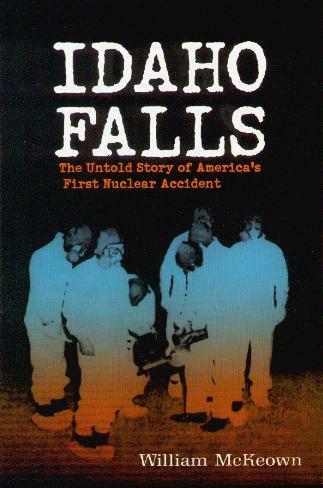 More than 40 years ago, the first and only fatal nuclear accident in America occurred in Idaho's Lost River Desert. Protected by government coverup, it's almost as this disaster never happened back in January 1961. Journalist William McKeown chronicles the lives of two young men from back east who came west in 1959 to start their lives at the nuclear testing ground. Work progressed at the new plant but way back in 1954, the first international nuclear meltdown took place, to see "if a radioactive core could melt and destroy itself". This in the name of discovering cheap electricity to power America's homes and industry. I don't understand nuclear power that much but learned that there were five long rods that plunged into the core and I found this quote very helpful and explanatory: "... the movement of the rods up or down allowed operations to control the chain reaction sparked by the more than seven pounds of uranium 235 located deep within the reactor. The bottom end of the rods contained fins made of cadmium, a metal that absorbs neutrons and slows the activity of the atoms inside the radioactive metal. As the control rods were raised, moving the cadmium, or poison, away from the enriched uranium, a nuclear reaction produced heat that turned water into steam, which in turn was used to spin a generator to produce electricity". On January 3rd, 1961, the two young men from back east, and another, were killed in a nuclear explosion, the first in the world. Investigations that took place were inconclusive, one favoring personal problems and possible suicide, another an industrial accident. It's shocking and alarming to read about this and how so many subsequently died of cancer, where the radiation clouds floated to, and what damage it could do in the future. Conclusion - Interesting, especially for those who don't quite fully understand nuclear power.